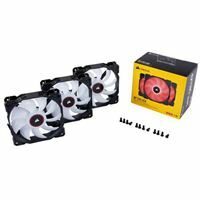 CORSAIR AF120 LED cooling fans combine bright LED lighting, strong static pressure, low noise and high airflow to deliver great cooling performance anywhere in your PC. Whether its as an intake or exhaust case fan, or mounted to a CORSAIR Hydro Series liquid CPU coolers radiator, AF120 LED fans provide up to 52 CFM of airflow where your system needs it most. 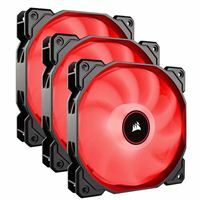 Available in a choice of red, white or blue, AF120 LEDs four hub-mounted LEDs radiate vivid and diffused lighting across a specially designed opaque fan blade, illuminating your system with a brilliant burst of color.